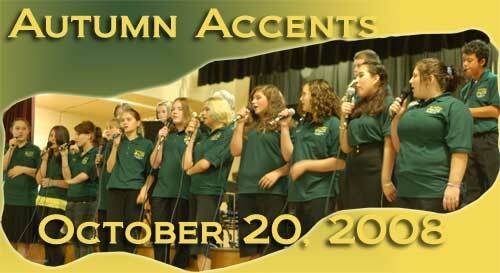 Family and friends were treated to a great concert held in a packed Monticello cafeteria on October 20th. Pictured above is the Show Choir with the Jazz Band backing them up. Dr. Richard Kirkpatrick views the certificate David Walworth, Longview School District Music Coordinator presented at the Autumn Accents 2008 concert on October 20th. 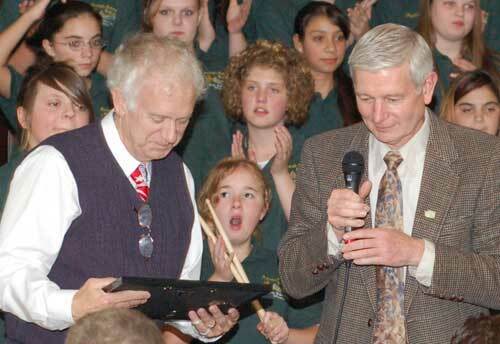 The concert was dedicated to Dr. Kirkpatrick who has been kind and generous to our students over the years. Dr. Kirkpatrick was recognize for his contribution by the Washington State Music Educators at the state conference last year. He has donated over 100 instruments that ensure that every student, regardless of financial status, may be a member of band and orchestra. As evidenced from the large number of students in both these programs it is clean his efforts are being rewarded. In addition, Dr. Kirkpatrick saw the need to replace the basketball hoops in out gym and did so with glass backboards this last summer. Thank you Dr. Kirkpatrick for all you do! !